Margarine vs. Butter? It’s a no brainer! | That's Bad For You! 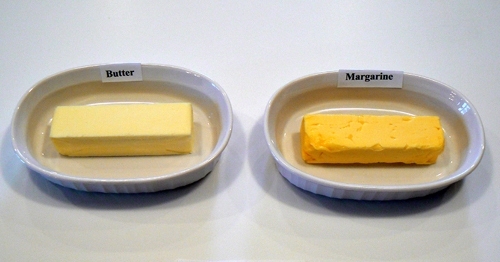 Margarine vs. Butter? It’s a no brainer! Margarine can look like butter, is often substituted for butter, but no my friend, it is NOT butter! Margarine tastes nasty…period. I can instantly tell when I’m spreading margarine on my bread because it looks funny and even has a plasticy, fake smell. It has a nasty chemical taste that makes my taste buds angry. Margarine can make even the freshest, warmest, most delicious baked bread taste unpleasant. Do you know the disgusting truth about margarine? Margarine is actually a chemical substance that is made from a process that is terribly unhealthy for humans and animals. That’s why animals or insects wont even eat it, so why do we? Are we that dumb? Not me! I’m going to keep avoiding this stuff at all costs! What are other bloggers saying about it? Are you going to throw out all of your nasty margarine and start spending just a little extra for real butter? It’s really a matter of unnatural vs. natural. Butter all the way! This entry was posted in BAD, Bad For No Reason, GMOs and tagged butter, chemical process, margarine by thatsbad4u. Bookmark the permalink.